I saved it for a trip to the beach. This quilt has been finished for months, but I could only photograph it in my favorite place. For obvious reasons, I would think! I love this quilt. 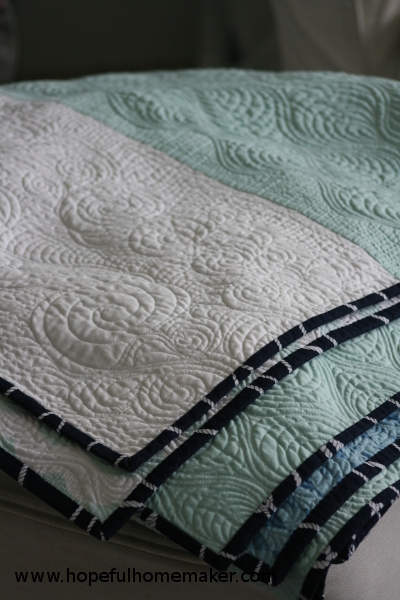 I love all the quilts I make, and every time I finish one, I think I *might* love it best. But this one is special. All my life, trips to the beach have been precious to me. It’s a place where I feel more whole than I do anywhere else. As a missionary I fell in love with the Puget Sound, with water and bridges and ships at anchor in harbors. With all of the colors that come with life near water. All of it. 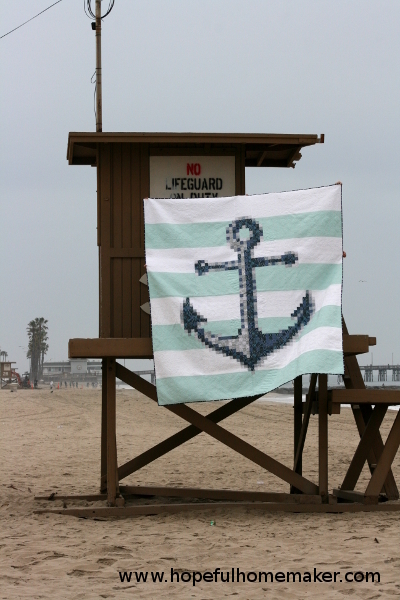 And though I live at the foot of the dramatic Wasatch Mountains, I’m a “by the sea” girl with all my heart. And anchors? Well, the analogy of anchors has ever been dear to me, and I’ve been blessed with some pretty secure anchors in my life. My friend Xenia quilted this for me, and I’m so happy with her work. 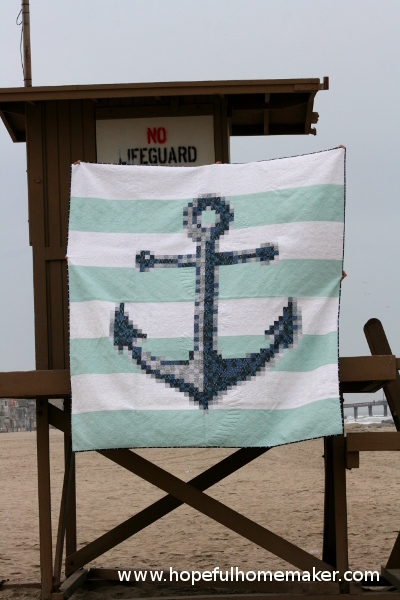 As I requested, she quilted the rope winding around the anchor and alternating patterns in the colored stripes, much like the original Anchor’s Aweigh quilt by Tula Pink. 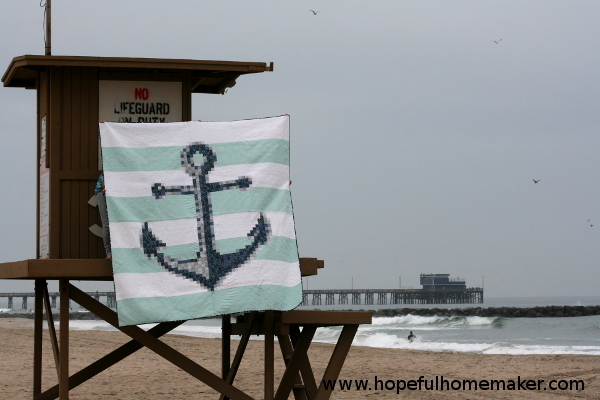 I love the way Xenia quilted alternating patterns into the alternating white and aqua stripes in the background. 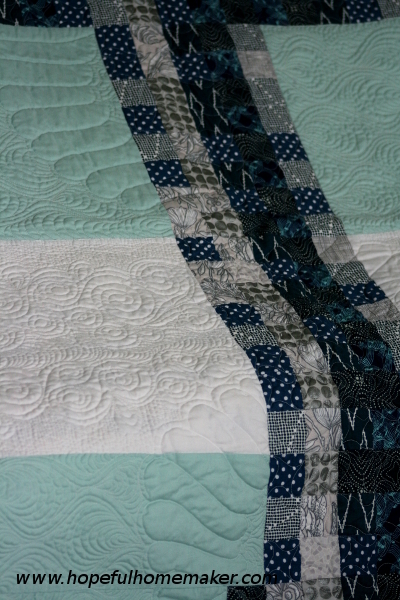 For the binding I used a navy rope print; it creates a subtle stripe look and continues the nautical feel of the quilt. It’s a really big quilt and I hope it will be one that we enjoy for many, many years. The making of it was fun – my sister Kristen and I each made one at the same time. There were hundreds of two inch squares to piece, but it was completely worth it. I’m thrilled with my anchor! Thanks for stopping by!